Rajasthan Sanskrit Teacher Admit Card 2017 – www.rpsc.rajasthan.gov.in - RPSC Sanskrit Grade Teacher Hall Ticket 2017. 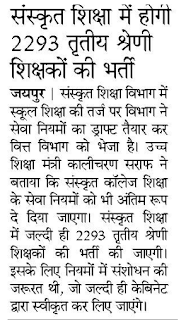 Rajasthan Public Service Commission has all set to upload notification for 3224 vacancies of Sanskrit Teacher and submission process for online applications is going to be started very shortly on official website www.rpsc.rajasthan.gov.in. The notification is expected to be available in April 2017. Huge numbers of candidates are waiting for these vacancies and are ready to fill the online application form. The final selection is to be made through measuring performance in written test and interview. The questions paper will be of MCQ type. There will be total 150 questions of 300 marks. 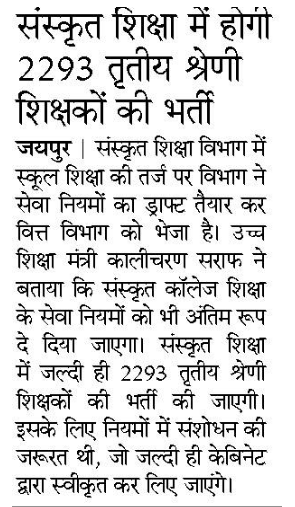 Those candidates who are willing to attend the competitive examination; they can download their RPSC Rajasthan Sanskrit Grade Teacher Admit Card 2017 from direct link given here. 1. Go to the official website and check ‘News and Event’ auto scroll column given at the right middle of the homepage. 2. Click on the appropriate link and enter your registration / login details. 3. Finally, press the login button and download your RPSC Rajasthan Sanskrit Grade Teacher Admit card 2017.